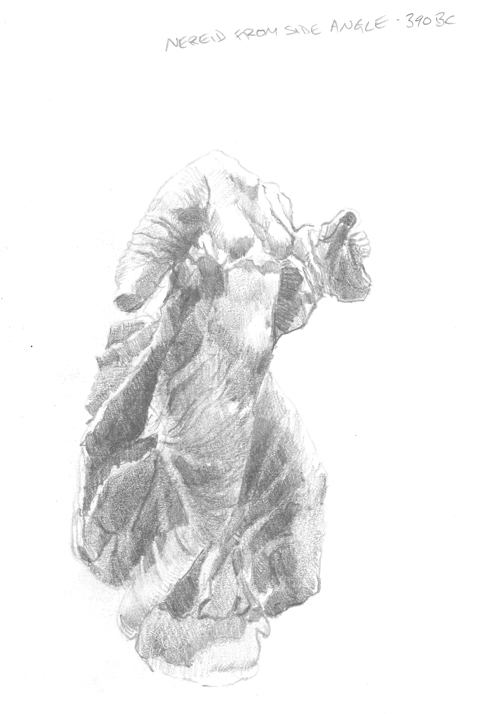 Another sketch of a Nereid statue from room 17 in the British Museum. From the British Museum's website: "The daughters of the sea-deities Nereus and Doris are known as Nereids. They were believed to be personifications of the waves of the ocean, and benign toward humanity. This figure is draped in a fine chiton (tunic), its folds enlivened by the rush of the sea breeze against her. A mantle falls over her left shoulder. She was carried along by a sea bird visible below the hem of her skirt. Her portrayal here is perhaps meant to suggest the means by which the soul of the deceased was transported to the afterlife." The sense of water billowing through drapery is so skilfully captured that you can almost imagine the stone animated with life, moving beneath the waves. Just an incredible level of skill by the sculpture and wonderful to draw. Dates from 390BC.